The history of war is marked by rational use of technology to increase the lethal force of weapons. In the 21st century we are observing a turning point in the dynamic development of weapon technology, strategies, policies, organizational structure, etc., known as "Revolution in Military Affairs" (RMA). One of the decisive features of this revolution is the reduction of casualties and collateral damage. The purpose of this paper is to examine the role of non-lethal weapons (NLWs) in current and future conflicts in terms of the most popular theories of RMA and the modern visions on the 21st century wars. 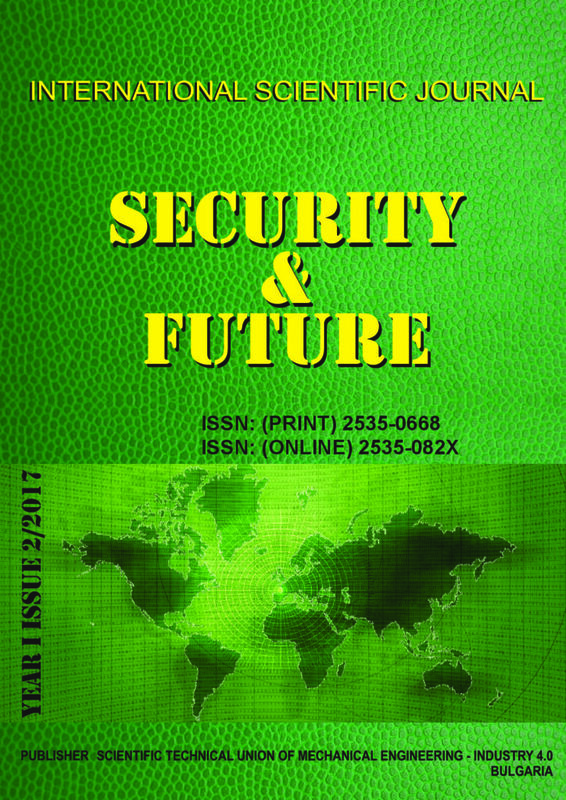 The article substantiates the urgency of the eco-anthropogenic component of national security both of the state as a whole and of its regions. The types of interaction between society and the environment are determined. It is suggested to consider the ecosystem as a complex combination of flora, fauna and dynamics of natural systems and processes, which interacts with social institutions and power structures. The concept of environmental imbalance is formulated as a real threat to the disruption of life support mechanisms and the creation of obstacles to the economic and social development of the country, improving the quality of life of the population. The main threats to the technogenic security of the country are identified. Cross-border cooperation (CBC) in the Mediterranean region is an effective instrument of the European Neighbourhood Policy (ENP) that gives different opportunities which have a positive influence on the aspects of the “wider” security – political, economic, social, ecological and cultural security. Seven members of the European Union and ten partners from the North Africa and the Middle East take part in the Mediterranean CBC. The Mediterranean CBC is analysed as a system with two environments – external and internal. The report presents PESTEC-analysis and SWOT-analysis. Also, it shows the logical relation between external factors, internal characteristics and future results of cross-border projects. Applying a strategic tool of TOWS-analysis, it helps identify relevant strategic options that the Mediterranean CBC could pursue. Furthermore, the TOWS analysis enables to develop “maxi-maxi” strategies – those with the greatest potential for successful and effective CBC in regard to the aspects of the “wider” security. The aim of this article is to describe the general methodology of early warning systems. The common disaster monitoring system was analyzed, and the construction system of disaster information management system was discussed particularly. This paper addresses traditional views of early warning systems and what is needed to turn them into efficient, people-centred systems. With regard to the nuclear power stations located near Bulgaria, we will look at the sites that would have an impact on the change of the radiation gamma background on the territory of our country. We will also consider the possible new nuclear power plants near our border and sites where nuclear installations could be located. This paper focuses on multi-factor authentication methods. It primarily addresses biometric methods, in particular authentication through written expression. It summarises the results of many years of research activities by the authors in the field of the dynamic biometric signature1 (DBS), including new experiments. It concludes by comparing this type of signature with a signature based on cryptographic methods with a view to the current eIDAS Regulation. Detecting vulnerabilities for a network is an important procedure which ensures that all the data, network-based applications and information communicated in this network, is secure. Detection of network vulnerabilities is used to determine weaknesses of the network, the risk evaluation of attacks, the diagnosis and suggestions to solve the problems. There are several types of scanning tools used to detect vulnerabilities, offering different features. In this paper, we will present a performance comparative study between two most used free, software based, network vulnerability scanning tools: Nessus and Retina. The comparison will be based on three main features: The ability to search, Scanning Time, The ability to detect vulnerabilities. In the conclusions of this paper, both scanners performed very well in vulnerability identification. In terms of speed without active Web Application feature, Nessus performed much faster than Retina; (on the other hand, with active Web Application module, Nessus performs much slower than Retina. In terms of scan depth, Nessus has a small advantage, since it includes a web mirroring tool that is very helpful in HTTP. The Personal Communication Systems with global coverage use Integrated Satellite-Terrestrial approach with Low Earth Orbit satellite constellations. The frequency reuse problems in such systems are discussed. The advantages of the implementation here the proposed by the author Space Correlated – Code Division Multiple Access are considered too. The principles of generation and synchronization of used Unique Pseudo Noise codes are shown. The system architecture of a IST PCN, based on the proposed by the author Spatial Correlation Processing – Random Phase Spread Coding technology for LEO,s terminal and feeder lines, is given too. Suicide bomber attackers with improvised explosive devices hidden inside their body cavities may be a new danger to air transport security. Metal detectors, passive and active millimeter or terahertz waves imaging, x-ray backscatter imaging and portals for race particles detection are not sufficient for detection of explosives concealed under thicker layer of material with density and dielectric properties like human body. Through x-ray imaging is problematic for public health regulations and so only nuclear quadrupole resonance seems to be the solution. The current work is related to improving security by developing a new type of fog sensors and devices. We investigate fogs and their ability to absorb and clean various pollutants from air, including chemical, biological, radiological and nuclear (CBRN) agents. Fog can be used very effectively for counteraction to terrorist attacks and weapons of mass destruction, as well as for prevention of industrial accidents and disasters. It is crucial to study the specific sizes of fog droplets, which optimally collect dangerous substances. We present a computational fluid dynamic model for estimating droplet number flow rate through a laser beam. It shows, that we can make a quantitative assessment of both the number flow rate and the droplet diameter distribution. After we have confirmed that it is possible to monitor these parameters, we proceed and investigate how they are varied, when the laser beam’s distance from the nozzle is changed. Thus, by selecting the distance between the laser beam and the nozzle, it will be possible to measure the diameters and the number of fog droplets. Different nozzles can be simulated easily by entering their output parameters (mass flow rate, diameter distribution, orifice diameter) in the setup. The current work is related to improving security by developing a new type of fog sensors and devices. We investigate fogs and their ability to absorb and clean various pollutants from air, including chemical, biological, radiological and nuclear (CBRN) agents. Fog can be used very effectively for counteraction to terrorist attacks and weapons of mass destruction, as well as for prevention of industrial accidents and disasters. We present a device developed by us – Fog Detector 3 (FD-3), which main purpose is to continuously monitor the atmospheric air and to produce analogue signal proportional to the density of any present aerosols, including water fog. The main components of the device, as well as their connections and way of operation are described. In the recent years, large improvement is being achieved in the area of decontamination by fog of environmental pollution caused by natural and industrial disasters or attacks with biological, chemical, nuclear weapons of mass destruction. Basic to this technique is the performance of sensors for the existence of pollution and fog in the environment. This article is going to present a small-size and relatively inexpensive instrument, developed by us, which purpose will be to alert the occurrence of visible pollution in air or mist. In that way, it can be controlled, too, whether the cleaning mist has reached all areas. It is possible, that this equipment would assess the density of fog. It works in the infrared spectral region. Currently terrorism is one of the biggest threats for the security on national and international level. The increase of the terrorist activities led to the expansion of tasks performed by the Armed Forces. In a significant part of cases due to the specificity of the anti-terrorist activity the sound of the shots should be hidden. This can be achieved by using special devices called suppressors. That require determine of target area limits which is the purpose of that report. The report presents investigation of the protective characteristics against knife penetration of several combinations of materials used in armored vests. Experimental results for each combination obtained by testing with two types of knives at various energies of impact are analyzed and interpreted.